Hộ gia đình gồm nhiều thế hệ chung sống ngày càng tăng, sinh viên ngày nay đa số quay về lại sống với cha mẹ; Sẽ tác động ra sao vào nhu cầu nhà cửa? 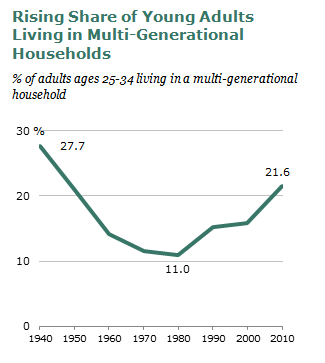 Multigenerational Households On Rise; Boomerang Students Return Home; What’s the Impact on Housing Demand? According to a study by the U.S. Census Bureau Multigenerational households on rise in U.S.
More than 4.3 million, or 5.6 percent, of the 76 million family households in the U.S. today are multigenerational households, or families living together that include a grandparent, parent and children as well as other family members, according to a study by the U.S. Census Bureau’s American Community Survey. There was only a gain of .3% in the 10 years between 2000 and 2010, but a gain of 1.6% in the next two years. That small 1.6% increase represents a decrease in demand of 1.216 million homes. However, those survey results are for three generations and thus do not include all the kids graduating from college, with no job, and moving back home. Boomerang kids with no jobs returning home has an even greater impact on housing demand. CNN Living discusses the “boomerang” effect in College grads and their families learn to live together. More than half of college graduates move back home, sociologist Katherine Newman wrote in her book, “The Accordion Family: Boomerang Kids, Anxious Parents, and the Private Toll of Global Competition,” based on surveys conducted worldwide. And many of them are finding it isn’t as painful as it sounds, she said. By setting ground rules and establishing expectations on both sides, parents and their adult children are learning to live together. Perhaps that’s because it’s such a common phenomenon. A Pew Research Center analysis of U.S. census data found that the share of Americans living in multigenerational households is at its highest level since the 1950s. For adult children, part of the fear of returning home has to do with being torn away from their social circles. But, thanks to social media, especially Facebook, they’re staying in touch with more friends from different times in their lives, Newman said, and finding that others are moving back home, too. The Pew report found that among adults ages 25 to 34, 61% said they have friends or family members who have moved back in with their parents over the past few years because of economic conditions. The Pew Research Center notes The Boomerang Generation Feeling OK about Living with Mom and Dad. To be sure, most young adults who find themselves under the same roof with mom and dad aren’t exactly living the high life. Nearly eight-in-ten (78%) of these 25- to 34-year-olds say they don’t currently have enough money to lead the kind of life they want, compared with 55% of their same-aged peers who aren’t living with their parents. The Pew Research survey found that among all adults ages 18 to 34, 24% moved back in with their parents in recent years after living on their own because of economic conditions. According to the survey 40% of 18- to 24-year-olds currently live with their parents, and the vast majority of them say they did not move back home because of economic conditions (in fact many of them may have never moved out in the first place). Among those ages 25 to 34, only 12% currently live with their parents, but another 17% say they moved back home temporarily in recent years because of economic conditions. Overall, 39% of all adults ages 18 to 34 say they either live with their parents now or moved back in temporarily in recent years, but there is considerable variance by age. Among 18- to 24-year-olds more than half (53%) live at home or moved in for a time during the past few years. Among adults ages 25 to 29, 41% live with or moved back in with their parents, and among those ages 30 to 34, 17% fall into this category. What’s the Impact on Housing Demand? 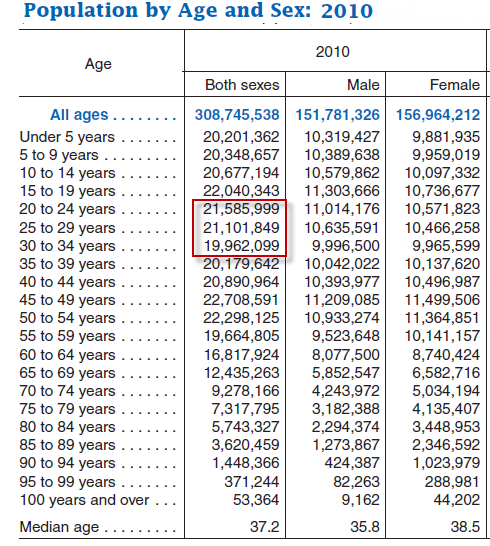 According to data from Table 2 (above) of the 2010 Census, there are approximately 62.65 million people in the 20-34 age group. If 24% of them are currently living at home for economic reasons, that represents a potential 15 million houses, apartments or condos. Wow. However, the survey results are based on those who moved in “for a time during the past few years“. It does not detail those currently living at home due to economic reasons. On the other hand, the survey does not reflect households doubling up, friends sharing houses or condos, sisters or brothers sharing houses, etc. Thus, a precise impact is not at hand, but it appears to easily be in the millions, and that is on top of the 4.3 million three-generational households as noted in the first link. Next Next post: Thông tin nghịch lý hay Âm mưu nhà nước?